Belmont Village only had one-bedrooms, no two-bedroom. Other than that, it was OK. The staff was fine. Everything was great. We walked around and saw the outside. They had a place to walk around, which was nice. Everything was nice. I personally call Belmont Village Sabre Springs a 5-star elder care. It was more on the upper scale and it was very large. It had a very nice dining room type setting where everybody meets. For people that can afford it, it was a very nice place. It had everything. The rooms were beautiful, very well-kept, and very clean. It had nice outside areas, like the gardens. Belmont Village Sabre Springs was clean and nice. It seemed very good, but it was not what my father was looking for. It was too fancy for him. They seemed to be pretty friendly; we did not meet too many staff. Belmont Village Sabre Springs is a very nice place. It's a little bit on the countryside, so it was wide open with beautiful scenery around and mountains. The facility looked very clean and nice, and you don't have to buy into it, which was certainly a positive for us. The food was good. Overall, it was a very nice facility. The person there was very helpful. They didn't have a swimming pool, but they had a small gym and an outdoor garden area where you can walk. They had group activities like yoga. Thank you for visiting our community. We understand the importance of finding the right fit for your loved ones and appreciate your consideration. Our community does have a swimming pool for residents to enjoy along with a putting green and ample outdoor space to enjoy the scenery. If you have any questions or would like to schedule another visit to see the amenities you may have missed on your first visit, please contact our community relations team. The community areas in Belmont Village Sabre Springs are very homey with people using them every time I’ve been in. There are always people in the living room, which is the first area you see. There is always a lot of people in the dining area and using the facilities and always some interaction going on. My mother is receiving very good care. She’s not a very easy person to deal with, so I give them a lot of credit for that. The grounds, rooms, and dining area were very nice. The neighborhood around Belmont Village is also very nice. I’ve seen them bring up food to my mom on a tray because she does not want to go to the dining area, and it looked pretty good to me. Every day, they have some activities going on, like bands and singers visiting and wine and cheese parties. I would recommend this place to other people. We are so fortunate to have found Belmont Village Sabre Springs for Dad three plus years ago. Dad started out in Assisted Living and is now in the Neighborhood. Every one who works here is like our own family. We couldn't ask for anything more and are so thankful for the care and love they provide. Thank you for allowing us to be a part of your family and for sharing your experience. It’s been our privilege and pleasure to serve your dad for the past three years and we continue to enjoy having him in the community. My father had been a resident in the Neighborhood section of Belmont Village (BV), Sabre Springs for close to five years. BV provided my father with the comfort, care and social engagement needed as a senior with severe dementia. For my family, BV provided us with the security and ease we needed to ensure that our father had the best, safest, cleanest residence available. The PALS truly care about the residents. They had incredible patience and affection for my dad. They treated him like a family member. Inan, Beth and Jessica were incredible advocates for all the residence in order to provide the best care possible. And, at the time of my father's passing, I could not have asked for a better support team. In addition to the Hospice care, my father received, BV allowed my father to die with dignity in his own residence and not be transferred to a hospital. I offer regular testimonials about BV to my friends who are in the same situation dealing with an elderly family member with memory care issues. Indeed, one of my friends has her mother comfortably living in Belmont Village of Encinitas. Thank you for taking time out to share your experience and for allowing us to be a part of your family. It was our privilege to care for your father. Please know that we remained committed to supporting your family and let us know if there is ever anything you need from us. My husband was in Belmont Village of Sabre Springs for three weeks. It's a great place, but my husband was asked to leave because he was falling too many times. Their activities program was the best, and that's what my husband enjoyed. He likes playing cards, Blackjack, poker, current events, and crossword puzzles. It's a great place for someone who does not need one-on-one care. It's clean, and the staff were attentive. It was a good experience. His room was good, and the grounds were beautiful and maintained. Our aunt is now living in a place called Belmont Village of Sabre Springs. This facility is a recommendation from a personal friend whose father has been there for several years. One of the reasons why we selected this facility is because they have a memory care facility, and we are seeing that my aunt is getting to be more like that now, although she does not need to be in a locked door facility yet, but we thought if that happens we wouldn’t have to move her into another facility. They have a very good program for people with milder dementia. They don’t need to be in a locked facility; it's called Circle of Friends. Another thing that they have, which I think is very good, are several mobile doctors, and they come to this facility. When you go inside, it's cheerful with lots of light from inside and outside. It seems like you are going in a hotel. I moved my mom to Belmont Village. It is only 7 minutes away from my house. It is very clean. The staff is very professional. My mom is having a hard time this past couple of days because she comes from another facility, but I think once she gets used to it, she will really like it. Her room is nice and big enough for all of her things. It has a nice view, and I like it. I had lunch there, and I will rate the food a 5. They have very good activities, and I am excited for her to like it. I hope she likes it as much as I do. The facility itself is beautiful and the program is very flexible to meet each residents unique needs. My dad has been there for about a year and a half. He started in assisted living and is now in the Alzheimer's care wing and we are working with Hospice. The staff is very welcoming and they really care about their residents! I had a visit at Belmont Village at Sabre Springs and the place was really spacious. They have a lot of outdoor space and sitting areas. It wasn't just long halls with rooms of each side. They have swimming pool for water aerobics. The place was just really nice. An uncle of mine is staying at this facility, and has been staying there for a few years now. I must say that both he and our family love how much care he is receiving here! When we first toured there, on first impression, it was very clean, and had a friendly and fun atmosphere. Which turned out to be true. We were afraid that he wouldn't be cared for, or he would grow bored and depressed staying there. But that's not the case, he is receiving the perfect amount of attention and care. The facility has many things for him to occupy himself with, and he couldn't have been happier! I definitely recommend this for your loved ones! We were very impressed with Belmont Village Sabre Springs. It's independent living, but it tends to be more on the assisted living side. It's a very nice place, it's in a good location, it's very clean, and it looked very nice. We saw a room that was already occupied. You have to bring your own furniture. Belmont village was very nice, and they provided independent living all the way to memory care. The staff member answered all my questions, gave me a tour, and I thought they were very knowledgeable. The independent apartments looked very nice, the dining area is nice, I didn't try the food, but it looked good. They kept it really clean. The memory care also looked good. Belmont Village Sabre Springs would have met my friend’s needs very well. It’s one of the best in this area. It’s a beautiful environment and seems to be very well staffed. It’s a very active community of people, but he’s quite a bit younger than the average resident. Their average age there is 85, and he’s 54, so he could not picture himself in that environment. The rooms were beautiful. Marie took us through and explained everything, including the pricing. She did an excellent job and answered all of our questions. They had different sizes and styles of rooms. We lived in Belmont Village for four years. The staff was very good and helpful, but they didn't have two-bedroom, two-bath. It wasn't big enough, and we had to share a bathroom. Otherwise, it was very good. They had three sit-down meals, which was moderately good. The dining room was functional, not fancy. They had lots of activities like movies, trips to tourist places, cruises, and museums. Belmont Village is very nice. The people that work there are extremely caring and helpful. They have a lot of activities. They have a bus or a van that takes them out on trips. The surroundings are very nice. They have a nice warm pool. They have different size rooms. The room that my sister is actually living in is a one-bedroom den. She had a TV room or a living room, another room for her bedroom, and a bathroom. We decided on Belmont because she enjoys her visit there, and they are so nice to her. She says, "Well, this is my home." My mother moved into Belmont Village Sabre Springs and is now adjusting quite well. She now refers to it as the hotel, which is a good thing. With her particular level of dementia, they have created a particular program called A Circle of Friends. So they help her with her needs in the mornings, and she joins her Circle of Friends for the day. After her final meal in the evening we hired outside help for a couple of hours when she tends to have Sundown Syndrome, and they help her get ready for bed. So her whole day is pretty full, and she seems to sleep pretty well. Her circle of friends are the same every day, and are in the same level of dementia that she is. They keep them busy with activities and current activities, and they do a great job of that. The living environment is very clean and they keep it very well-maintained. The restaurant there continues to have a daily special for each meal, and they also have a reliable menu with different items. So there's a lot of variety available. They have movies, a little bit of wine tastings in the afternoon, and all of that comes with entertainment. They honor whatever holiday it is, and they involve the residents in the best possible way. They are keeping them active with projects, arts and crafts, and trivia; it's a pretty novel program. The staff is always very responsive. The food is excellent, I've dined in the dining room a couple of times. and it's been great. I'm going to say that for the price we're getting exactly what we need. Belmont Village Sabre Springs is located in the attractive residential community of Poway. Situated in northeast San Diego County, Poway is known as “The City in the Country” and prides itself on the fact that much of the area is preserved as dedicated open space. With great views of the valleys and foothills of North County, Belmont Village at Sabre Springs is a beautiful Mission-style community with outdoor features such as lush grounds and walking trails, a pool and putting green for our senior living residents. 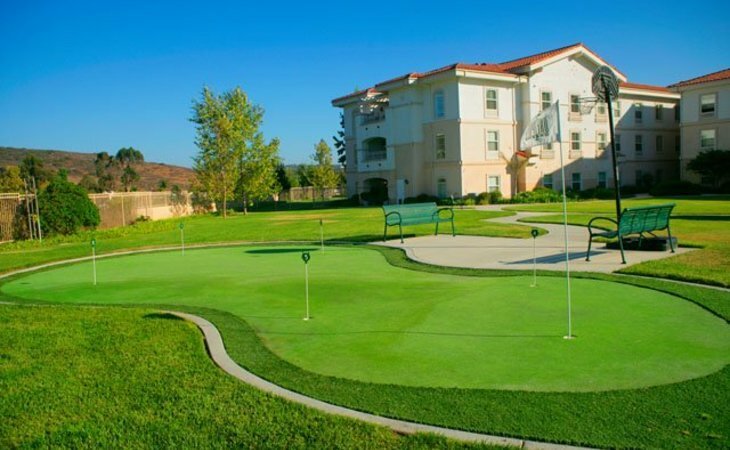 Conveniently positioned near shopping, two large medical clinics and Pomerado Hospital, places of worship, eateries and the Poway Center for the Performing Arts, Belmont Village also offers exciting indoor activities and caring services. Residents enjoy Belmont's distinctive interiors and signature programs in hospitality and dining. And those with support needs benefit from one of the best-trained, most responsive staffs in assisted living. There are five things that make our community unique. 1. We have 25 choices at dining. 2. Nurses are on staff 24 hours a day, they are the only ones that administer medications, we can also accommodate sliding scale diabetic injections. 3. We have Physical Therapists on staff that conducts our exercise programs. 4. We have 4 levels of memory care. 5. Lastly, Married couples can stay together through almost all processes of ageing. What should caregivers and potential residents know about Belmont Village Sabre Springs?